One thing that is evident in this issue from the start is that this is definitely the pre-World’s End Authority. Before Dan Abnett and Andy Lanning’s World’s End run humbled the team and hopefully taught them a few things about being heroes, the Authority were basically powerful jerks. The funny thing is this was the appeal in the beginning for a lot of people. Warren Ellis (who created the team) was obviously using the team to poke fun at DC’s Justice League (which was ironic since DC had just purchased Wildstorm). It’s that same attitude that’s evident here as we see the unceremonious way they deal with the events of the last issue. There is also still that sense of arrogance as we see how they deal with the threat brought up in this issue. The Carrier has always been a point of mystery in The Authority books. 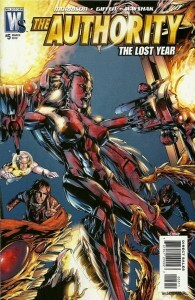 Ed Brubaker touched on its origins slightly in The Authority: Revolution. And as evidenced by last week’s World’s End title, The Authority #18, that mystery could potentially be answered soon. But we learn here that for as powerful as The Carrier has proven to be, it does have its weaknesses. It’s this weaknesses which presents a huge dilemma for the team by the issues’ end as we get a pretty harrowing cliffhanger. With this new arc we also get a new artist in Jason Wayshak. I’ve never previously seen his art but I did find that he did work on two Wildstorm mini-series before: Ferryman and The Lost Boys: Reign of Frogs. His art gets a little too cartoony sometimes for my tastes, especially with some of the facial expressions. But I did like his design for one of the creatures in the issue. It reminded me of something you’d see in Sam Keith’s series The Maxx. Overall, a good issue that had a lot of action and very good cliffhanger but I think it could’ve been a tad more new-reader friendly. 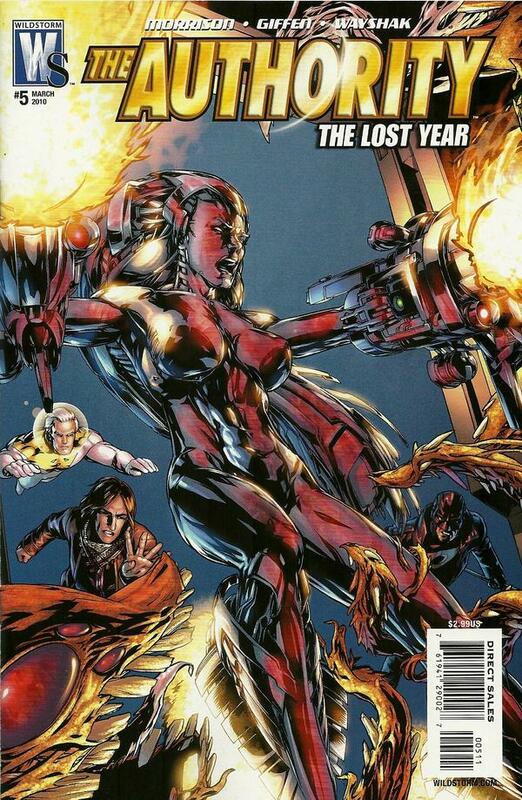 This entry was posted in Reviews, The Authority: The Lost Year, WSU and tagged Alex Sinclair, Allen Passalqua, authority, Gene Ha, Grant Morrison, Jonathan Wayshak, Keith Giffen, kristy quinn, review, Rob Leigh, scott peterson, The Authority: The Lost Year, wildstorm universe. Bookmark the permalink.